This is the cake that we drove to Vegas! Our very good friends invited us to come celebrate their marriage and asked if we would mind bringing along their wedding cake. We'd been planning this for months and months! How to transport, how to keep the cakes cool, when to bake the cakes, when to make the icing...so on and so on. Rodney and the groom (Tyler) came up with a ice chest/refrigeration/coolant system. They built an ice chest out of styrofoam and included chambers for the cakes to sit on (with dry ice underneath) to keep them cool the entire car trip there. I baked the cakes the afternoon before we left. We leveled and got them all crumb-coated and set them in their places for the trip, with the dry ice below. 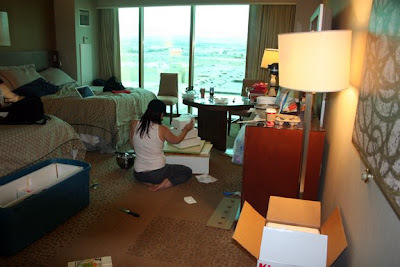 We made it to Vegas with all of the cakes in tact, including the dummy cake that I iced a week before we left. 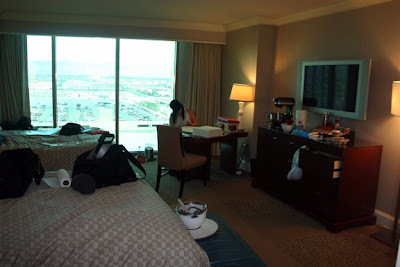 We arrived in Vegas around midnight (their time) and settled in for the night. The following morning I woke up and immediately got to work. 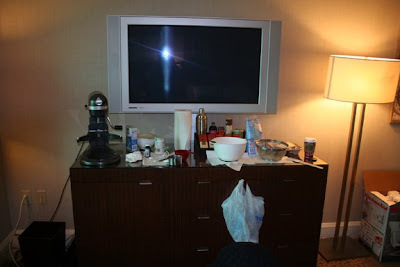 We set the mixer up on the dresser and started plugging away. The cake! The bottom tier is the dummy, the middle is key lime with strawberry buttercream and the top is vanilla with strawberry buttercream. The entire thing is covered in vanilla buttercream. 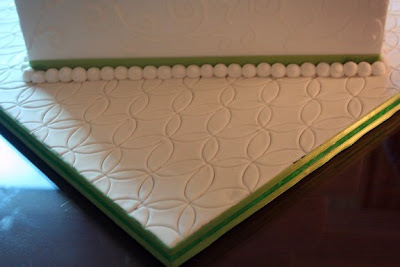 The board was covered in fondant before we left and embossed with an overlapping oval pattern. The pattern was used in the invitations that the bride and groom sent out so it was nice to be able to incorporate that! 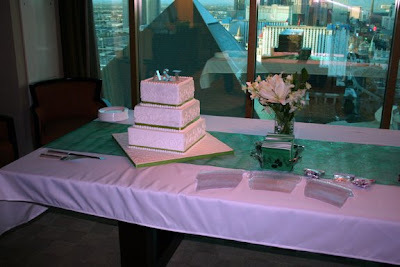 Some photos from the "cake party" in the suite the bride and groom had! I did have some issues with the icing. The weather is much drier there and I think traveling through all of the different climate changes might have affected the shortening a bit. 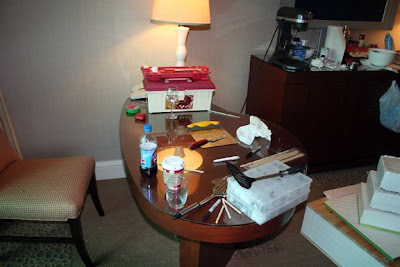 Regardess, I think we were able to make it look half decent for traveling 20 hours from Texas! 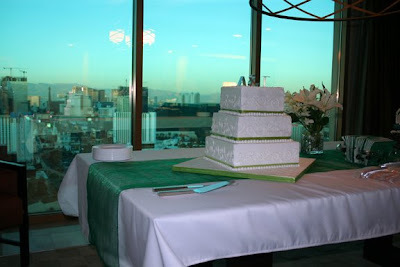 We had a blast with this cake and a blast in Las Vegas! Thanks so much and congratulations to Amy and Tyler! That's a gorgeous cake. Very nice! The cake looks beautiful. I love the cake board. This is brilliant. I love the pic of you sat finishing the cake! Fabulous board too! You go girl! I have been waiting and watching for this post!! The transport unit to keep the cakes cool was brilliant! The cakes were gorgeous. And the combo sounded so yummy! You have been one busy baking and cake making lady! Kudos to you!!! The cake turned out fabulous! 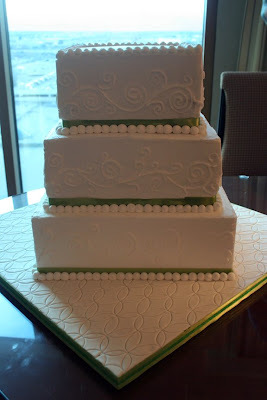 I definitely feel your pain when seeing the photos...I finished my best friends wedding cake in the hotel room the night before since I was in the wedding too! So crazy! The the design on the board is amazing by the way! That is so awesome. Loved it.